Considering that every machine taking part in the Sunbeam Motor Cycle Club’s annual Pioneer Run from Epsom to Brighton on Sunday, March 19, was well over 100 years old, there was an amazingly low attrition rate along the way. 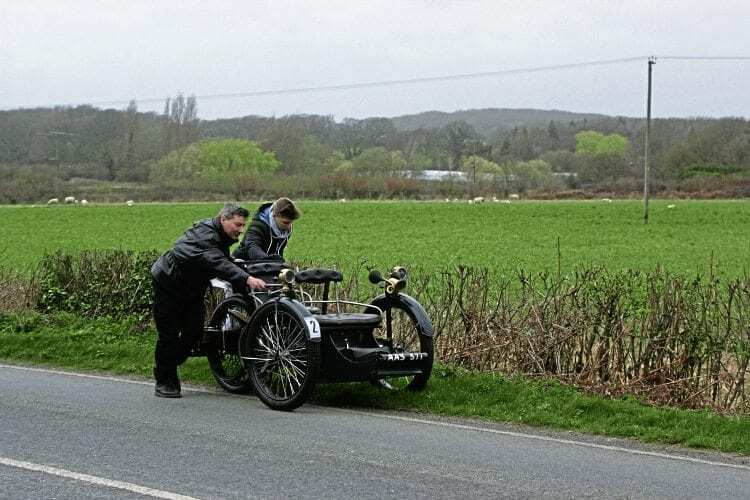 There was an unscheduled stop along the way for this 1896 2.5hp Leon Bollee entered by Scott Brown from Southam. This year’s 78th Pioneer Run from Tattenham Corner to Brighton, organised by The Sunbeam Motor Cycle Club for machines registered before the end of 1914, attracted no fewer than 317 entries, of which 271 actually started and 256 made it to the Madeira Drive finishing point. The fact that only 15 of the starters were unable to complete the journey – a remarkably low attrition rate despite all the machines now being well over 100 years old – speaks volumes for the riding and mechanical abilities of the entrants, including those from all over Europe. Weather conditions were cold but dry, and among those taking part was Sammy Miller, once again riding the 1912 Alldays Matchless that finished the run without incident. Vast crowds gathered in the presentation area on Maderia Drive upon the completion of the run, where the Mayors of Epsom & Ewell and the City of Brighton & Hove were there to welcome the riders and present the trophies. On the Sammy Miller Museum’s display stand stood the 1907 TT-winning Norton, which drew the attention of onlookers like a magnet. The V-twin was bought from Argentina over a year ago and was in such a sad state that it took the museum’s workshop a long time to restore it. Read more in the May issue of OBM – on sale now! Previous Post:Lovely artwork – but who really lived there?